After the announcement that the second Captain America film was going to feature The Winter Soldier, first everyone went onto Wikipedia to look up who he was; and second, everyone knew he would be getting his own title to capitalize on the film. At first Marvel published Winter Soldier: The Bitter March written by Rick Remender, which was great and I highly recommend checking it out, around the time the film was released. 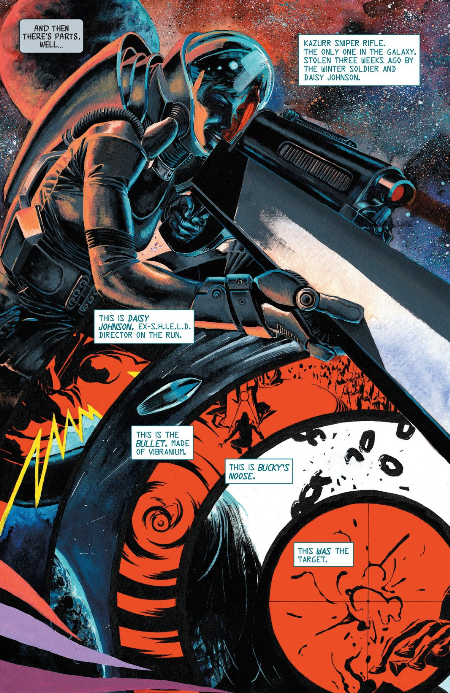 Now, following the events of Original Sin, Bucky has been given his very own ongoing title written by Ales Kot and drawn by Marco Rudy, but IN SPACE! So how does the first issue of a series that Marvel released to capitalize on the success of the films, which is also spinning off a Marvel event no one talked about, pan out? So the first question most people would ask about this title is whether or not they need to read Original Sin in order to fully “get” this title. The answer is no. If you have read the event, than Bucky’s current situation as a proactive space assassin won’t be as jarring. If you haven’t, all you need to know is that Nick Fury (the real one) kept a constant watch for any threat to Earth, whether it be from alien invasions, extra-dimensional demons, or horrors from beneath the Earth’s surface, and killed them before they could even begin their goals. Bucky accepted to take up the mantle of “The Man On The Wall”, and that’s all you need to know. The recap this book provides is adequate enough if you’re still lost as to why Bucky is killing alien dictators with sniper rifles that can fire from the moon to the surface of the planet it’s orbiting, but you should be fine as this starts its own story separated from the rest of the Marvel Universe. The writing in this issue may catch some people off guard when they hear it’s about someone taking on the responsibilities of protecting everyone on Earth by killing any off-world threats that so much as thinks about causing trouble, in that it’s written very humorously. By that I mean Ales balances the heavy nature of this title’s material with funny banter between its characters. 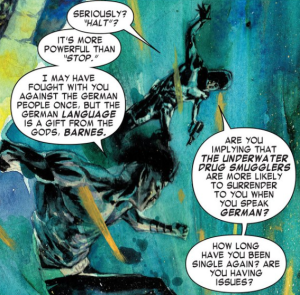 The conversations Bucky has with Daisy Johnson (Look Her Up) and Namor are fun to read, but still show that he means business about what he’s doing. But the true star of this issue is Marco Rudy’s gorgeous artwork. The majority of this issue consists of either single or double page splash pages, which normally would be a negative, but hear Marco uses every inch of the page and develops some truly unique visuals. Underwater battles, sniper missions in space, and intergalactic restaurants on Mars, all of these he depicts with gusto in this painted/cartoony style. Unfortunately, while Marco’s art is the highlight of this issue, and I I’m definitely looking forward to more of it, it’s also the biggest problem of the book. As much as I’ve been praising the unique look of the book, sometimes it gets a little too stylish and the actions being depicted become difficult to interpret. The murky coloring, especially during the underwater section, don’t help much either. There are also several instances where the book sets up a pattern for how you are supposed to read page, and then changes it halfway through, resulting in one or two rereads to fully understand what’s going on. Not all this books problems lie with the art, however, as Ales Kot’s script leaves little story here until the last page. There is setup for things to come and fun action beats, but the plot is very light here. Overall, this is a fine first issue to a series that I have high hopes for. 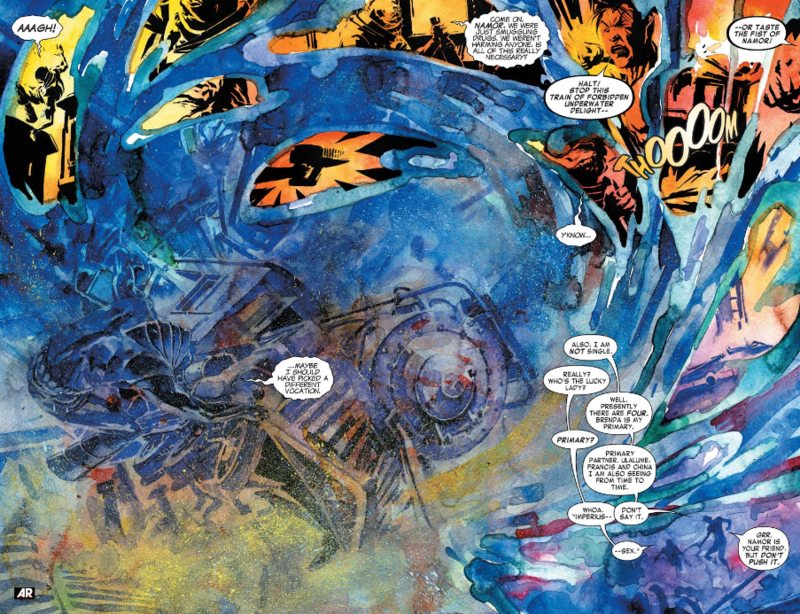 The artwork is amazing, and unlike anything you will see from either Marvel or DC (or even Image honestly). And while the art can get a little hard to follow here and there, and there’s not a lot of story here, the unique layouts and interesting setup for the future of this series makes this issue worth a look.